As Christmas approaches, we would all do well to remember the sacrifices of our troops. As we celebrate the beauty of the spirit that guides this special time of year, let us not become lost in the shuffle of shopping, but take the time to give thanks for all that is good in the human spirit. Too often, especially in these times, we cannot help but focus on the myriad wrongs being perpetrated–from MS-13 running amok and unchecked in our suburbs to the White House running roughshod over our Constitution to Congress, rubber stamping their own violations thereon, we are assaulted daily with outrage on top of outrage. And so it is that, too, Christmas arrives each year to remind us of the good, the brave and the loving among us, and to show us that we, too, can adopt the spirit of Christmas, even if it’s temporary. For we need to keep that image in our hearts and minds: that positive power of example we can retain throughout the year and model after. 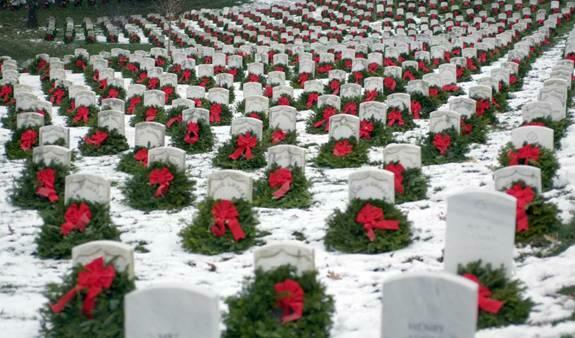 For example, each year since 1992, Merrrill Worcester, of Harrington, Maine, provides these wreaths, which number about 5,000, and pays the shipping costs for them to be delivered to Arlington, Virginia, where volunteers, many of them school children from Maine, lay them on the stones of our honored dead. Our deepest thanks to those who served, and to the State of Maine, its school children and to Merrill Worcester, and wishing you a blessed Christmas. I title this post thusly for several reasons, not the least of which being that I have now had the opportunity to spend 3 days abed with Law & Order, CSI and TCM, which today kept me company with the Silver Screen of the ’30s. Although the styles may have changed–directing, acting slang and dress–the message remains the same: in life there is conflict and with direction, determination and integrity, we always win in the end–even if it means dying, as Bette Davis showed us in Dark Victory. That film also showed is that, even starting out as an obscure actor can end one up in the White House, as Ronald Reagan appeared in a bit part alongside Davis, Fitzgerald and Bogart. The more things change the more they stay the same; films of the ’30s illustrate that better than almost anything else. Today we face far more serious challenged than even those of the 1930s: we have lost the checks and balances of our Republic; our Military is not uniformly supported by some of its commanders; our White House has been breached by an illegal alien, our Dollar is almost worthless; our Bill of Rights is being trashed as we speak, and we remain at war in the Middle East with no end in sight, even as Iran’s People continue to protest their own tyrant in its current incarnation of Ahm-a-dinner-jacket etal. This is not to say that we are beaten; it is only to remind us all that, no matter how hard the fight, we SHALL prevail, because WE ARE AMERICANS and we do NOT take this kind of crap. We may be naive and trusting to a point, but when it finally dawns on us that we are being had, we FIGHT BACK! I get hundreds of letters from people who tell me that THEY will never give up, and they mean it. They are veterans, Blue Star and Gold Star mothers, and active duty, civilians from all walks of life, all colors, creeds, religions and cultures. But they are AMERICANS, first, last and always, and they will fight to preserve our Republic and its Constitution. After 3 days away from a computer and 594 emails to show for it, I got one from a friend who had just returned from a camping trip in the mountains, snow and all. His words, with which I titled this post, rang true and reminded me that, even though I’ve been out of the loop for a few days, This Too Shall Pass, and as long as I/We keep our resolution to maintain Direction & Determination, we, too, shall prevail. Join me as I appear with hosts Sgt. Tim Harrington & Mack Ellis on tonight’s edition of American Grand Jury with updates on Walt Fitpatrick III, Grand Jury actions and other things of dire importance. And now–back to the Silver Screen until 9 EST…only 500 more emails to go! Catch it–Davis at her best, with Bogart, Fitgerald and Reagan!